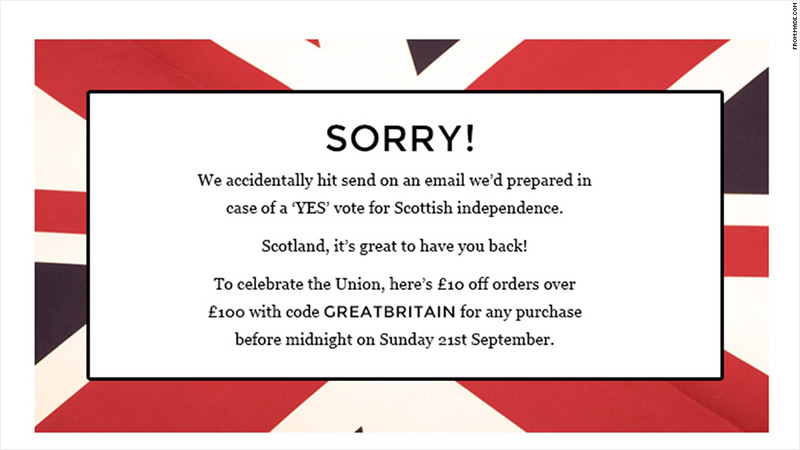 Customers of an online furniture retailer may have woken up Friday thinking Scotland had voted in favor of independence. Landing in their inbox around 6 a.m. local time was an e-mail from Made. Over an image of Scotland's flag, the Saltire, Made heralded the birth of a new country and offered discounts to celebrate. "As a little patriotic inspiration for the newly-independent country, take a peek at our selection of blue, Saltire-inspired products below," it said. Unfortunately for Made, the e-mail coincided with Scotland's independence campaigners conceding defeat. "It's been a long week for us and we were gripped by last night's referendum meaning a late night and some bleary eyes, but you guessed it; our emails this morning were deliberate," said a spokesperson for the company. "Scotland, we love you and hope no offense was caused." Made -- based in the wealthy north London neighborhood of Notting Hill -- rushed out a second e-mail about half an hour later. It offered the same discounts, only this time with an image of the Union flag to celebrate the survival of Great Britain. The company promotes a range of designs, groups orders over a week, and then arranges production for just the volume it needs. It claims to save buyers as much as 70% off the price of equivalent products at leading stores. Its backers include Lastminute.com founder Brent Hoberman, and John Hunt, who founded the Seattle Coffee Company that was sold to Starbucks (SBUX) in the late 1990s.